CHICAGO -- A nonprofit group is reminding Americans that not everyone celebrates the Fourth of July the same way. Military with PTSD is dedicated to helping veterans cope with post-traumatic stress disorder. The group says that the sound of fireworks can trigger painful memories for some veterans struggling with PTSD. "It's almost like being stuck in a nightmare. It's scary. And, you know, most men won't say they're scared but it's the truth. We are terrified around this time of the year. What I would do is stay inside," said BJ Little, veteran. 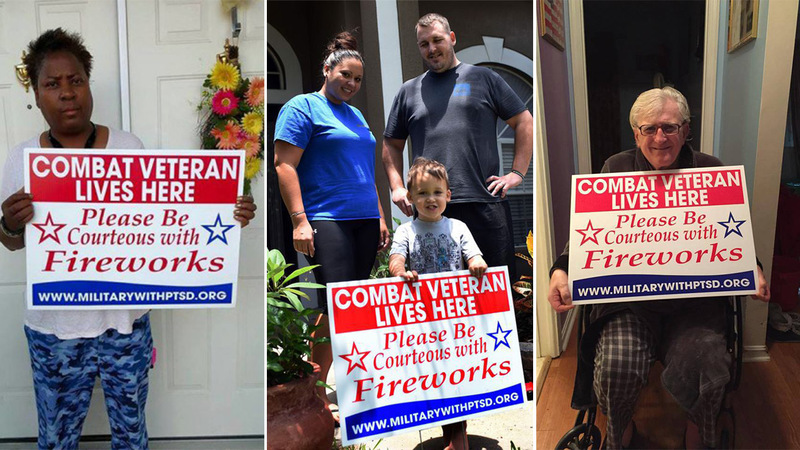 Military with PTSD asks Americans to be courteous when planning to use fireworks this holiday, especially if a veteran lives in the neighborhood. The group suggests giving veteran neighbors a warning. In preparation for the holiday, Military with PTSD offered free yard signs to veterans around the country that read, "Veteran lives here. Please be courteous with fireworks." To learn more about the group, visit militarywithptsd.org.